Godwit Days hosts a week-long festival and other special events throughout the year. Click on the links below or you can go to our Events page to see a complete listing of all currently scheduled events. You will create your User Account the first time that you Check-Out. If you already have a User Account, go to the log-in page. Here is a link to a page which explains our Accounts and Booking process. This is a fundraising event sponsored by local brewers, Mad River Brewing Company, in Blue Lake, CA. A portion of sales from every beer sold is donated to Godwit Days the evening of the event. We ask that people call in to register for any trips offered with this event, we charge minimal fees. There is also a small silent auction, live band, and taco truck at the event. People meet and carpool for birding trips at the brewery. 3-Day all-inclusive trip to Lake Almanor with lodging at the Bidwell House Inn in Chester, CA. Look for nesting grebes via boat on Lake Almanor with local Plumas Audubon Chapter Guide. Birding with Godwit Days guides to and from Lake Almanor. We will be offering two tours aboard the historic Madaket vessel out of Humboldt Bay, Eureka, CA in August. Departure times are 4pm and 5:15pm. Local bird experts David Fix & Rob Hewitt narrate this tour around the bay while participants sit back and relax with appetizers and their choice of a glass of beer or wine. We have been offering this trip since 2010 and it has become very popular. We encourage people to sign-up early as these trips do sell out quickly. We offer on-line registration for these trips. The Fall Preview offers a weekend of birding in and around Humboldt County, CA. Ten birding trips are offered with small group sizes for a more intimate experience. The focus is on rarities and birding hotspots. All field trips meet at the Arcata Community Center during the April festival, unless otherwise noted. Transportation for most trips will be by carpool, unless indicated otherwise. Carpools will be arranged at the start time of the trip. Please arrive 10 minutes prior to departure to organize carpooling and check in with your field trip leader. Be sure to verify that your trip leader has the best phone number to reach you, should your group become separated for any reason. Wear comfortable hiking boots/shoes and dress in layers, bring food and water since most trips do not include stops for food. Many trips do not have restroom access either. Remember to bring binoculars, a hat, warm clothes, scope and tripod, field guide, bird checklist, notebook and pencil, sunscreen, rain gear, camera, insect repellent, and FRS handheld radio (channel 7). 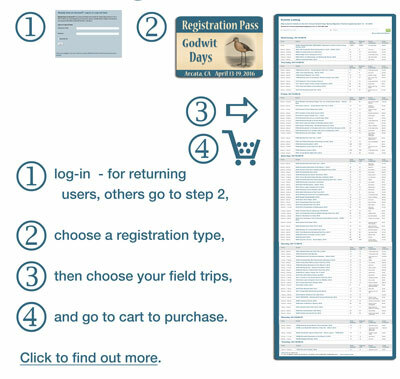 Waiver of Liability: Godwit Days non-profit organization requires a waiver of liability for participation in field trips and activities during the Godwit Days Spring Migration Bird Festival held April 17-23, 2019 and other Special Events. (See the full Waiver here.) You will be required to signify that you have read the Waiver on the Check-out page. Agreeing to these terms indicates that you understand that any activities, especially those out of doors, entail some risk, and that you agree to hold harmless Godwit Days, its officers, agents, contractors, or organizers, from and against any and all claims & liability for damage or injury to persons or property resulting from your own personal activity, conduct or actions.